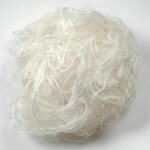 50g bags of throwster's waste filament silk strands, perfect for silk paper making. These are pure mulberry silk filament strands full of natural silk gum (sericin) making them perfect for silk papermaking. 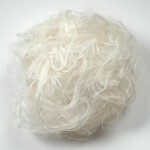 The main reason for working with throwster’s waste is because if the natural occurring gum that is coating the fibres. 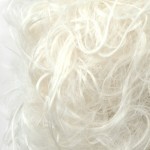 This gum will bond when activated with heat and moisture and therefore creating silk paper becomes very easy. Tease out a few layers of filament, spray with water, lay them between two sheets of greaseproof paper, iron with a hot iron and the fibres will bond together. This “paper” is slightly more wiry and lacy than paper made from cocoon strippings, but gives an interesting texture and can be combined with cocoon strippings to add firmness. This lustrous paper is somewhat whiter than cocoon paper and can be dyed with hot or cold water dyes or painted with silk paints and stitched into. 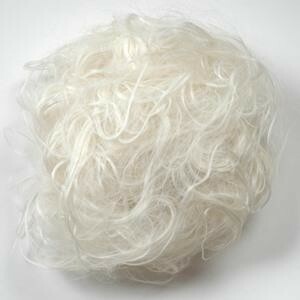 If you wish the gum can be washed out of the waste (de-gummed) creating a much brighter, whiter fibre. It then no longer has the gummy capacity so can be treated like any other silk fibre - it could be needlefelted, dyed, spun or carded with other fibres to create traditional felt. Throwster’s waste creates unusual texture when made into silk paper for a cobweb effect and lots of possibilities.